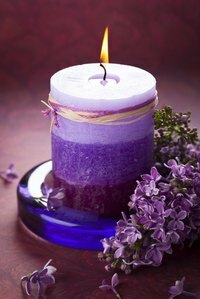 Strong, sweet, tart and spicy essential oils add a delicious scent to homemade candles. Sometimes, it is more satisfying to create your own candle scents from fragrant foods at home. A homemade scented oil is made through relatively passive processes. Certain foods make better scents than others. Herbs and spices carry a very strong scent that can permeate carrier oils with ease. The resulting fragrances are lovely and have more use than just candle making. A carrier oil is needed to absorb and retain the aroma of any food you want to turn into a fragrance. Pale or completely colorless, carrier oils have little to no scent. They are nearly always plant-based oils, so they keep a long time. Good carrier oils to consider are olive, safflower, sesame, almond and canola oils. Herbs and spices are the easiest foods to use for making fragrance oils. Flowers, and strongly scented rind fruits are another good option. Citrus zest provides a very strong, distinct flavor to candle fragrance. You can use fresh or dried herbs and spices. Look to the cupboard for last-minute inspiration. Cinnamon, vanilla, mint and thyme can all open up and add their own scents to a carrier oil. You may even consider mixing foods for a unique fragrance. Try orange zest with a few drops of vanilla for a fragrance reminiscent of an Orange Creamsicle. The term "enfleurage" refers to a cold steeping method for creating fragrance oil. The fragrant foods are placed in a container of cool carrier oil and allowed to sit for up to several weeks. The container is shaken every day, and also kept in a sunny location. During this time, the oil becomes imbued with the essential flavors of those foods. Periodically, the foods may be removed from the oil and replaced with fresh ingredients to create a stronger fragrance. Another similar technique is "maceration," which uses the addition of heat to speed up the process. As with enfleurage, the foods are added to oil and then the container is sealed. For a couple of hours each day, the entire container is placed in hot water. The water heats up the oil and the plants, helping to draw out more of the natural fragrances.